The sand dunes of Namibia are massive. Largest in the world. More than 400 meters tall. So you would be right in thinking ‘to capture them I need to bring the widest lens I own’. In my case 17 mm and on a fullframe 5D MkII that is very wide. But you should also bring the longest zoom lens you have. I brought my Canon 70-200mm f/4 L, one of the best lenses Canon makes and great for landscapes. I could however very easily have used a 400mm zoom or more. Only a few places in the Naukluft National Park can you get up close and walk the dunes. This is a good thing, or there would be people and foot prints everywhere! The rest of the time you will be parked on the side of the road going into the Sossusvlei and Deadvlei dunes and you will actually be quite far away from the dunes. 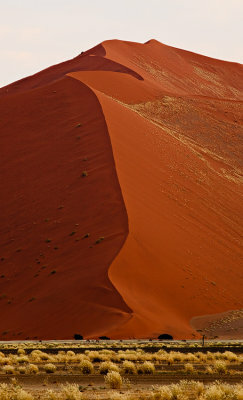 The sand dunes at Namib-Naukluft are shaped by a wind alternating from either the ocean to the west or the desert to the east. This ensures a perfect sharp crest on the towering dunes that seem to reach into the clouds. When people view images of the dunes they have a hard time understanding the scale. Your brain cannot comprehend sand dunes taller than Empire State Building. This is where your longest zoom lens comes to the rescue. The large dunes offers some outstanding photo opportunities in the morning or afternoon where the strong side light will highlight the razor sharp crest. And if you get lucky you can include wildlife grazing in front of the dunes to provide some scale. This is exactly what I captured in the image below. It is shot at 200 mm and cropped somewhat to zoom in further. I could easily have used 400 or 600 mm zoom. Fortunately the 70-200mm is tack sharp, when viewed at full size you can clearly make out the tiny oryx (antilopes) and trees in front of the massive dune. I would however have loved to be able to zoom in a lot more and not include any sky at all so next time I am bringing at least a 400mm zoom. The 60 km drive from the gate of the national park into the Sossusvlei and Deadvlei dunes is 60 km of pure magic. It is one of the most beautiful things I have ever done. The outer gates open at 6am so you will be driving in through the dunes just as the sun is rising. Well, there is also an inner gate, opens at 5am. If you pay an absolute fortune for accommodation you can stay here, inside the park, meaning you get to take off at 5am. Clever business tactics here. If you do not wish to spend a fortune you can join the rest of us outside the outer gate waiting for 6am! Driving in is so magical I completely lost myself in the visuals. Apart from Deadvlei, which is so gorgeous you get high shooting in there, the drive into the park is the most beautiful part of the massive park. My friend kept asking ‘wanna stop? wanna stop?’ but I couldn’t answer. How do you decide where you want to stop when you have just landed on Mars? It’s all so otherworldly, so beautiful, so mind boggling. Fortunately I managed to mumble a ‘yes’ now and then, and she stopped by herself on occasions so we could capture gorgeous images. If you find yourself at Namib-Naukluft, take it easy, enjoy the ride and don’t rush to get to Sossusvlei where everyone else is going. Bring a mega zoom and remember to stop along the way. The journey is as important as the destination here, as it often is! 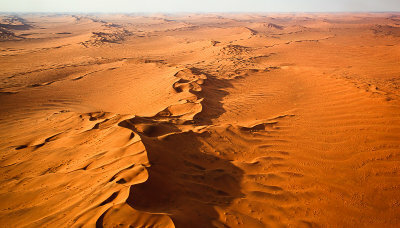 The Namib desert is the oldest desert in the world with the largest sand dunes, more than 400 meters tall. Sand dunes as tall as the Empire State Building, Uluru or the Petronas Towers in Kuala Lumpur. Taller than the Eiffel tower. 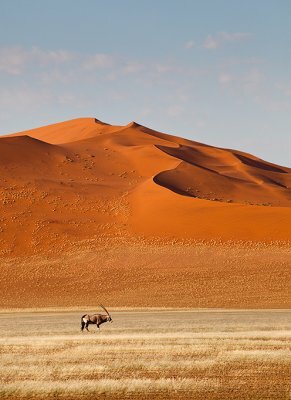 The Namib desert runs for more than 2000 kilometres up the coast. 2,000 kilometres of sand. These numbers boggles the mind. The tall sand dunes dwarfs you when up close and personal but to truly understand the size of the desert you have to take to the air. From the air the sheer size and grandness is revealed and your brain struggles to take in this sea of sand, a country of sand really! I have done quite a bit of shooting from planes and helicopters and is great fun but very hard to master. It is hard getting any worthwhile compositions from the air. Especially in a boiling hot plane as the air coming off the warm sand dunes is scorching. Adding to the challenge is the fact that looking through a viewfinder for extended periods of time while bumping along in a hot Cessna is the easiest way to induce motion sickness that I know off. All well worth it though as I doubt many sights in the world can compare to the mighty Namib desert from above! I have 140 shots from this 2.5 hour flight. From a plane you have to machine gun your camera a bit as there are bound to be some out of focus or motion blurred shots. I am kicking myself for not shooting any video but this was before I really discovered the fun of shooting video on the 5D Mk II. Also I was plenty busy shooting stills and feeling slightly queasy! These are 3 of my favourite images from the flight, more to come. 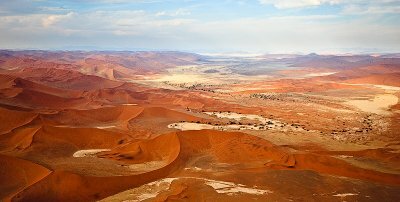 This is the area of of the classic Sossusvlei and Deadvlei pans. Top third in the middle you can just make out the end of the 60km road that runs from the gate entrance into the National Park. This is the only road into the park. From the air it works well to zoom in and pick out shapes and patterns. Patterns is something I am attempting to do more of. I have much to learn though as my eyes are attracted to grandscapes, not the details. With no time to switch lenses I should have brought my old 5D on board the plane as well with 70-200mm zoom attached so I could switch back and forth as I was using 5D MkII with 17-40mm zoom . It was the one day where I missed my 24-105mm L lens. One of my favourite Namib from above photos. Gorgeous ethereal sand dunes stretching into infinity in what really is a large sea of sand, nothing here but glorious sand! The afternoon light brings out the orange colour and creates great definition in the dunes with side lighting picking up every shape and pattern. I am happy with these images, I do feel I got something worthwhile from the air, if nothing else I got the magical experience of seeing the mighty Namib desert from above. So beautiful, so surreal, so otherworldly that you hardly blink for the duration of the flight! This is just one of several versions, I have a hard time picking out my favourite. There is a panorama I shall post as well. I used my 70-200mm f/4 L lens for this and I ended up using this lens much in Namibia. Often in the Naukluft National Park (home of the 400 meter tall orange dunes) the dunes are quite far away or you want to zoom in on a pattern. I could easily have used a 400mm for some shots so a new zoom is on the shopping list for next Africa trip. You may have noticed my blog posts are slightly shorter. I love writing but presently I do not have the time to write long elaborate posts and tutorials, takes 4-5 hours to put together. So for a while you may see more images, and less text, a move I am sure favoured by many! In actual life there is no question, like a solar panel I need the rays of the sun to energize me everyday. In my images it is a different story. Having the sun in the frame will burn out the red channel on a digital sensor and leave an ugly yellow brownish/greenish halo around the sun. To my eyes this looks even worse on print than on screen. Film or transparencies have a much nicer gentler curve so they cope much better with the sun in the frame, but digital is unforgiving. This does mean I delete images that otherwise are quite nice, but have a small burned out area from the sun. As I just started developing RAW files from Namibia, I ran into two of these images. So now I am asking you dear reader, what do you think of having the sun in the frame? Do you like it? Does it distract you? Do you dislike it? And photographers; what do you do to make images like these work – or do you delete them as I do? As examples I present two sunset images from driving 6 hours through the Namibian desert, from the capital of Windhoek to Swakopmund on the coast. A most special day with beautiful cloud cover (very rare) and 30 seconds of rain in the afternoon (very rare!). My Namibian friends tell me it was a day that happens once in 10 years. I am amazed by the big reflection of the sun in the grass. But, both images also have burned out sun, so please let me know if you think they work as I am not so sure. Perhaps I should have saved the title of my previous blog post for this. ‘What the hell am I doing here’ feels very fitting now that I, very surreal, seem to be back in Copenhagen. 84 mind blowing ‘the best days my life’ photography and adventure in Namibia, Western Australia, Malaysia and Borneo have come to a stop. But it is just a temporary stop to get rid of baggage in my life. Sojourning for ever as a travelling photographer. New horizons, new photographs await. My to-do list is overwhelming with RAW files to develop, getting new web sites, compressing my life and company into a travelling mobile package, prepare for next take off etc. First up is finishing the project for United Plantations and develop their images, so it may be a little while before I get to my own work and new blog posts with new photos. In the meantime, enjoy this image I shot at Deadvlei in Namibia. Namibia is the photographic highlight of this trip. It is the most beautiful place I have been. I am dead certain it is the most beautiful place in the world! It is also some of the best images I have created. I dreamed of a whole country of Wide Open Spaces. I dreamed but it was not a dream, it truly exists!